SURREY COUNTY COUNCIL PROPOSE TO MAKE the above mentioned Temporary Order under Section 14(1) of the Road Traffic Regulation Act 1984, the effect of which will be to temporarily prohibit vehicles from entering or proceeding in that length of Crab Hill Lane (D381) South Nutfield which extends from its junction with the access road leading to Crab Hill Farm to the southern property boundary of the property known as Pencaitland. 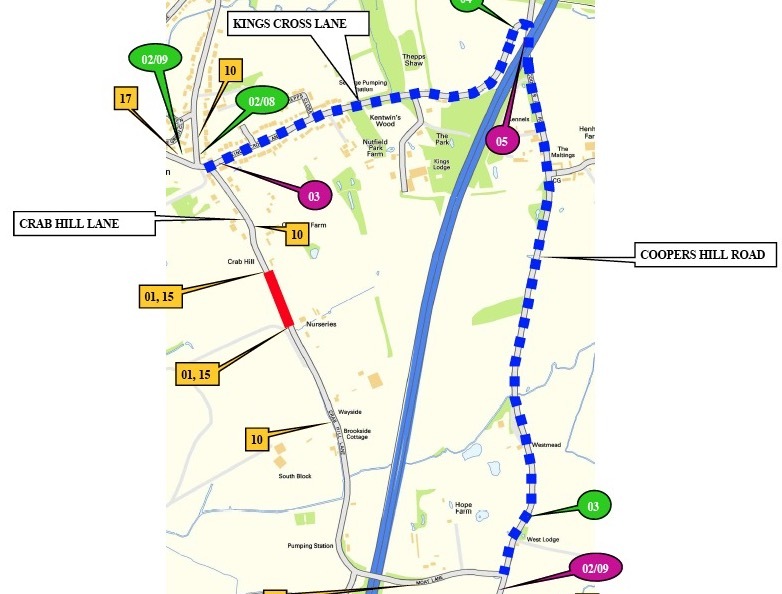 Vehicular traffic will be diverted via Kings Cross Lane and Coppers Hill Road or this route in reverse order. This Order is required because works are being or are proposed to be executed on or near the said road, namely works in relation to creating a new customer connection and/or telegraph pole works, to be carried out by BT. These works are anticipated to be completed within two days, between 09.30hrs and 15.30hrs, during the three month period of operation of this Order which commences on 25 February 2019. Advanced warning signs will be displayed and the temporary closure will only operate when the relevant traffic signs are displayed. Access to premises within the affected length of road, including access by emergency vehicles to these properties, will be maintained at all times as will access for pedestrians and cyclists.